This past weekend while I was at MEC BikeFest, I noticed a guy wearing a vest with a URL on it that said Cycle Realtor. My curiosity piqued, I had to go talk to him. 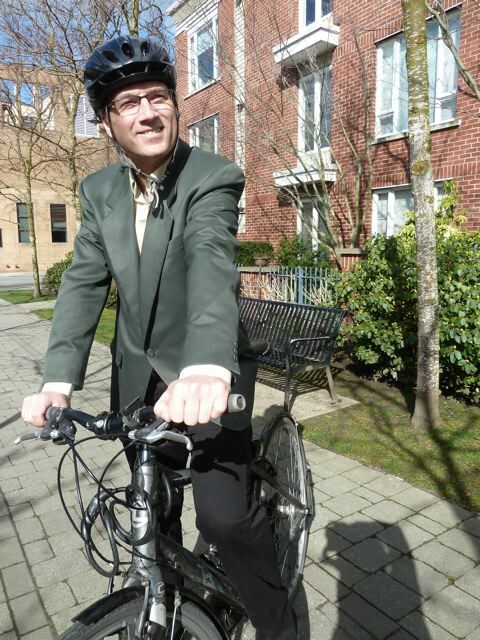 Mike Carrier is a realtor in Vancouver who runs his business by bicycle. He graciously agreed to an email interview, which I've posted the entirety of below. I started selling real estate early in 2000 with a small independent company on the North Shore (Angell Hasman & Associates) and now they are a large, very elite firm and I felt that West Vancouver was a good fit for a cycling realtor. The offices for The Residential Group are downtown and in Kits, but I work everywhere. Since I have moved my practice from the North Shore, I have been mainly working with my buyers network and that can take me as far as New West (the Sky Train is wonderful for bikes :-). Essentially I would like to focus more on my marketing strengths as opposed to my knowledge accumulated from living in many parts of the city over the last 25 years. I was born in Coquitlam and raised by wolves, strike that. I was raised near Mundy Park and spent most of my youth wandering its many trails, forests and lakes. My parents sold, moved east (Maple Ridge) and I moved into Vancouver at 19 and never left. When did you start cycling rather than driving in your business? I started cycling five years ago after a long hiatus and only in the last 3 years have I been full time for business and pleasure. Why did you decide to make the change & get rid of your vehicle? How has this changed your business? The choice was easy really. I was using my car mainly for trips out of town and transporting signs and riding the bike for work, but when I was in the car coming home one day with some groceries, someone made a hasty left turn and made a mess of the car. I never replaced it. How many kilometres do you think you put on your bike in a year? I don't know how many clicks I bike per week/month etc. I have had to rebuild the hubs and replace various parts on my commuter, but never keep track of hours logged. I am not your typical cyclist as I am trying "not" to workout. I give myself adequate time between showings so I maintain an "air" of professionality. Once in a while you will find me inside ice rinks preparing an offer presentation. You learn to use different neighbourhood resources when you the need arises. Who do you typically work with--are most of your clients cyclists themselves? My clients are just regular people with families. For years I was told that I need to drive a big car (preferably German at the least) to be a realtor, but even when I had a car, most of my clients had car seats and toys etc so they would prefer to just meet me there or follow me. That was part of the reasoning for not replacing my vehicle. I would love to work exclusively with like minded individuals and just use the bike, but when I am showing "out of towners" around, I rent a Modo vehicle and play the chauffeur with the local knowledge of the roads and services. I get the impression that many realtors think having a high-status vehicle is important for their image. Do you think you lose potential clients because you don't own a car? In West Vancouver, the industry is rife with high status this and high status that. Many realtors drive M-5s, Ferraris and Aston Martins. (my Cannondale Quick was out of place.) And yes, I have lost a few clients that could not get past the idea of my nontraditional way of doing business. It is a business entrenched in "tradition" or maybe the word stigma fits better. There is a woman (I don't know her name) in a Kits office that rides a lot apparently and the Shift Delivery Co-Op has a great platform as well. What are the advantages to biking instead of driving as a realtor? When I ride I have this big grin on my face (even in the rain sometimes) instead of the typical stress of being behind the wheel of a car and worried about a traffic jam making me late. You also have a better feel for the "soul" of the neighbourhood on a bike. You see the alley street hockey games instead of blowing by at 50. You see the poverty and the addicts, in other areas you see the community efforts to beautify the streets. I guess you are more a part of your environment when you don't have metal walls and windows surrounding you, therefore you experience more. The downside is you need to be better prepared and better equipped. I ride a battered and bruised Cannondale Quick something or other. It runs well most of the time and I don't worry too much about inadvertently losing it. I don't even have a "status bike", although I have an old carbon graphite Cadex that I rigged up some friction shifters to that works for my "road bike". What advice would you give to someone who's considering ditching their vehicle in favour of a bike for work? Don't delay: get some decent all weather gear and any kind of bike will do the trick. Upgrade if you need to later. It will put a smile on your face. 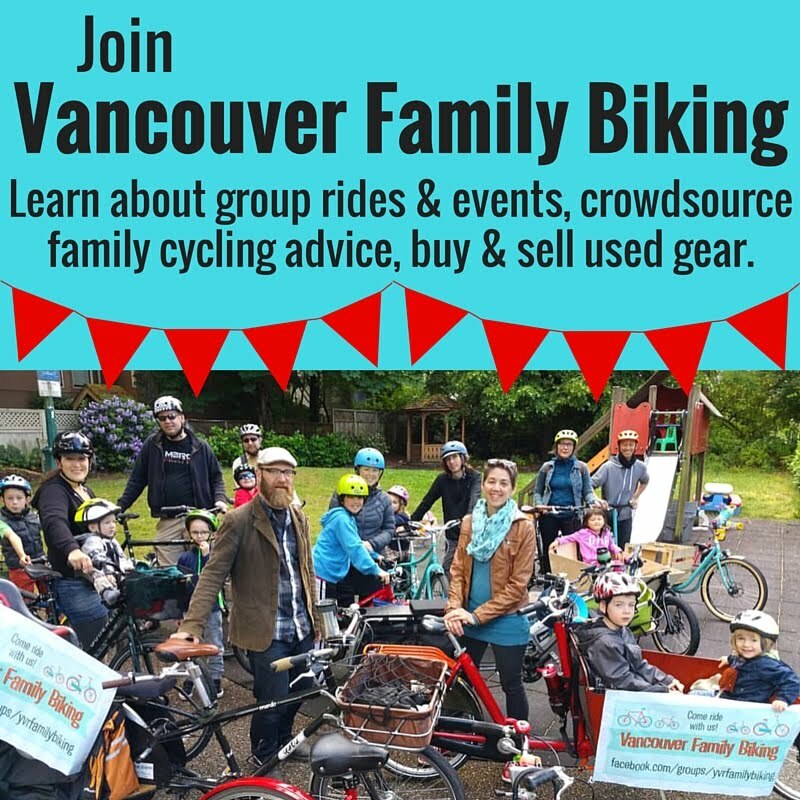 Bike Life is a regular feature here on The Sprog, profiling individuals & businesses in Vancouver that cater to or get around with bikes. If you or someone you know would like to be profiled here, please contact lisa DOT corriveau AT gmail DOT com. Wonderful! Nothing is more irritating than a slick, die blond realtor in a fancy car. Shame on them. Kudos to Mike! great, I support any business that uses bikes. C'mon do you really need a car in Vancouver. I get around just fine without one. The transit is great. I don't even live in Vancouver anymore. I cashed out.